" .....The triple-hybrid system, “PM Package MH30“, combines a fuel cell, a battery and supercapacitors to form an energy-efficient power system, replacing the standard battery package for the Class 1 forklift with an 80 V, 700Ah battery. 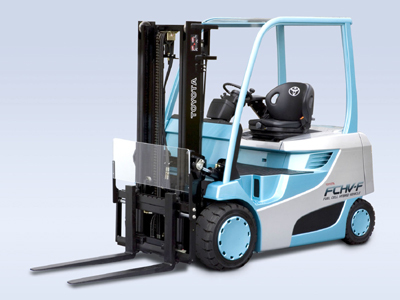 As all components are used in their optimal operation range, the system offers over 50% energy savings compared with diesel engine forklifts and fuel-cell-only systems. In addition, an intelligent energy management system controls the power distribution between the fuel cell, supercapacitors, and battery. The energy recovered during braking is stored in the supercapacitors and batteries, which provide peak power during operations such as acceleration and lifting heavy loads. 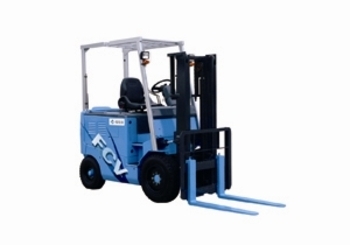 The 10 kW proton exchange membrane (PEM) fuel cell delivers sufficient energy to allow the forklift to work for an eight-hour shift and also features a short recharge time where users can refuel hydrogen for a full working shift in just one minute.